In the outlined voting method, ECP said that green ballot paper will be used for the National Assembly while a white paper will be used for provincial assemblies. ECP said that it is the first time that printed papers have been based on the security features. With over 46 million people set to vote on this Wednesday, the Elections Commission of Pakistan (ECP) has released the guidelines for the upcoming General Elections 2018 which will be held on July 25. In the outlined voting method, ECP said that green ballot paper will be used for the National Assembly while a white paper will be used for provincial assemblies. ECP said that it is the first time that printed papers have been based on the security features. The commission claimed that a total of 220 million ballot papers have been published by the upcoming elections. As per reports, the election officer will first check the national identity card the respective voter and then his name on the voter’s list. After passing the thorough checks, the voter will then be called out by his name and the serial number following which he/she will be allowed to vote. After the voter has contested the vote, the specific name will be crossed from the voting list and the voter’s thumb will be marked by a permanent link after his impression is taken on counter files. Later, an assistant officer will sign behind the ballot paper after which the specific voter will be issued a paper. The voting for Pakistan Election 2018 will begin on July 25 from 8 am till 6 pm. 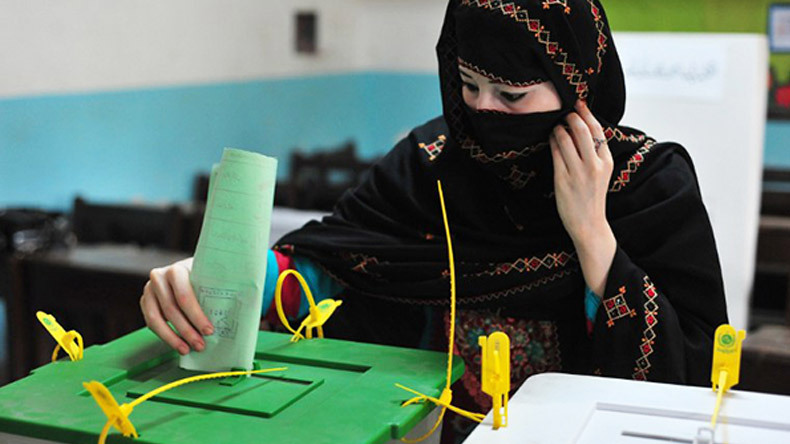 Election Commission of Pakistan (ECP) said that over 100 million ballot papers will be used in Balochistan, Sindh, Bahawalpur, Multan, Sargodha, DG Khan and Sahiwal divisions in Karachi. As per ECP, all four provinces except Karachi have received ballot papers. Reports suggest that the young guns from Pakistan are currently aiming for a change that will put them on the path of development. As per a report by Geo TV, several Pakistani youths armed with smartphones attacked a politician, landowner and tribal chief Sikandar Hayat Khan Bosa and called him a thief. The people have been questioning their leader over the work they had done for their constituency. As per opinion polls, 65-year-old Imran Khan’s PTI is said to emerging as the sole winner of the Pakistan elections 2018.